testo 6744 dew point transmitter | Převodníky | Typ produktu | Testo, s.r.o. Wherever compressed air, air or gases are used in industry, excessively high humidity can cause damage or impair product quality. You can use the testo 6744 dew point transmitter to keep trace humidity in your systems in check (e.g. in membrane and adsorption dryers). Prevent damage and reduce costs through the targeted use of measuring and control technology. Air, compressed air and gases are used in all areas of industry. Humidity and moisture are generally undesirable because they can cause damage or impair the quality of the end product. The use of measuring and control technology is recommended in order to monitor humidity in the network and prevent damage. Our testo 6744 dew point transmitter was designed specifically for measuring trace humidity in compressed air or dry air. It boasts a polymer humidity sensor which features a high degree of accuracy and long-term stability. Use the dew point transmitter to prevent damage (e.g. in refrigeration dryers or membrane dryers). This can save you a considerable amount of money, because if the quality of the end product is impaired in any way, it can prove costly. The cost of running adsorption dryers can also be reduced: accurate humidity-controlled chamber activation precisely adjusts the use of regenerated air to meet requirements – not at a preset time increment, which often creates unnecessary, excess consumption of regenerated air. 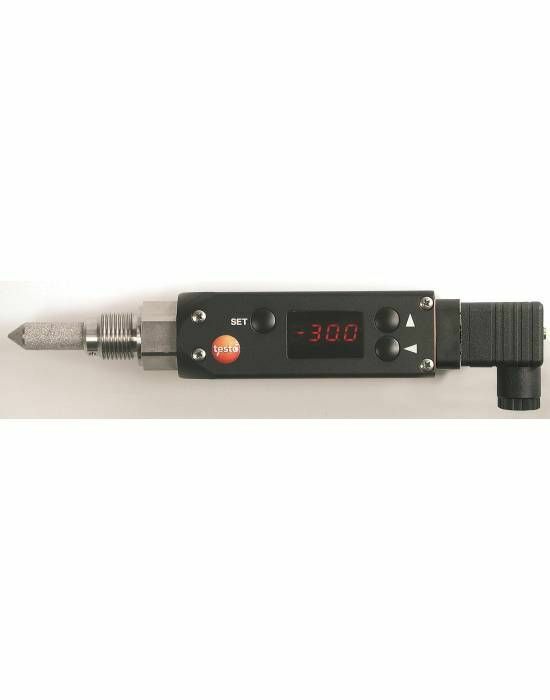 testo 6744 dew point transmitter to -45 °Ctd with polymer humidity sensor, display, process connection NTP½ thread, analog output 4 to 20 mA and optional alarm plug with 2 switching outputs.